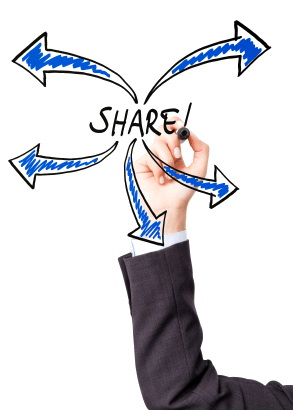 Why Share Other People’s Content on Social Media? I see it often. A Sage or Microsoft partner starts using social media and right away they’re promoting their products, their company, and their events. It’s not long before their Twitter stream or LinkedIn updates become repetitive and predictable … promo, promo, promo, me, me, me … it’s all about me! But in my opinion, that’s the wrong approach. Anytime I talk to Juice Marketing clients about social media, we always discuss the value of finding and sharing great content and useful resources … whether it’s on your own website or somewhere else on the internet. You can’t just pitch and promote your own stuff 24 x 7. Because when you do, you lose the interest of your audience and diminish the value of social media. It’s all about becoming a valuable resource. When you can dig up great articles your audience is interested in-regardless of the source-you’ll become more respected and your (posts) will be widely shared. And when you have some of your own content to share, people will be more likely to help spread the word. I usually explain it this way – sharing useful stuff in an unbiased way, whether it’s your own content or not – builds credibility and something I call “social equity.” In turn, that social equity earns you the right to promote your own content, products, and events once in while (without it becoming boring, repetitive, and self-centered). What’s a good ratio of your own content/promotion vs. outside web content? That’s up to you to determine. But I generally advise clients to consider two-thirds internet, one-third self-promo or company blog posts. For example if you’re posting 3 times per day on Twitter, LinkedIn, or Google+, that would be 1 post of your own content and 2 posts that point to useful stuff you find on the web. Then again, maybe 50-50 or 60-40 is right for you – the point is to mix it up, diversify your posts, and don’t be afraid to share other people’s content. Where do you find valuable content to share? That’s the topic of the same article referenced above and is probably a good place to start. 8 Ways to Discover Valuable Social Media Content.